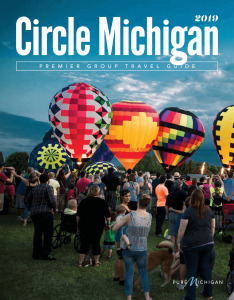 Explore museums, magnificent art, historical treasures and renowned culinary experiences in Michigan. Discover the beauty of lake shores, the quaintness of the beach towns or the wilderness of the Upper Peninsula. It is difficult to be still. So much demands our attention so often, so loudly. Even as we take precious time to unwind, unplug and understand what really matters in life, too often are we merely preparing to be pulled around again. So relentless are these forces that they haven’t even the courtesy to let us regroup for a much-deserved rest. They only grow more powerful and find ways to claim more pieces of us. Vacation no longer means what it once did. It is but a fleeting escape, a brief reprieve from our overstuffed schedules and undernourished hearts. Tapping into the essence of life requires more than a getaway to a beautiful destination. A place must impress you so deeply that you cannot help but let down your guard, unload the weight you carry and embrace all that makes you happy and whole. Welcome to Michigan, where visitors find parts of themselves they had long forgotten or considered lost. They are revealed through natural splendor, big city excitement, warm hospitality and fun-filled adventure. They are returned to their rightful owners. They reward you for remembering them, and continue to move you when you are still, long after you have bid farewell to an experience you will never forget. The serene energy that flows through the mighty lakes and rivers of Michigan’s Upper and Lower peninsulas will take your mind and body to places unreachable elsewhere. Find them in a kayak, trusty schooner, glass-bottom boat or by the strength of your own determined strokes. With more than 3,200 miles of Great Lakes coastline and 11,000 inland lakes, visitors need never venture too far to find the ideal place from which to embark on a refreshing float, cruise or swim. 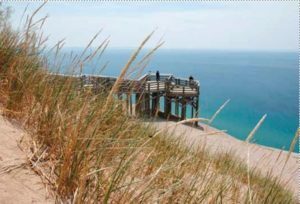 Look to the white sand shores of St Joseph, Benton Harbor, Holland, Muskegon, Charlevoix and Petoskey along Lake Michigan, just to name a few. Moving inland, sophisticated palates find epicurean bounty in cities such as Kalamazoo and Lansing, along with savory tastes of rural charm in Marshall, Portage and Coldwater. This region’s celebrated wineries, farm-fresh fruits and vegetables and world-class restaurants take your passions on an enjoyable ride. Rolling into the southeast, movement takes on different meaning. With its energetic Motor City vibe and that distinctive Motown beat, this place has a soul unlike any other — flashy, fun, steely and fast. such as Alpena, Blue Water and Flint, but you may still feel compelled to bring them home in beautiful, hand-crafted pieces. Holidays of your dreams beg to be touched in Frankenmuth, as does stunning architecture in Great Lakes Bay and Genessee County’s abundance of woods, water and trails. If communing with nature is how you best find peace, the Upper Peninsula’s breathtaking expanse of rushing streams and vast forests will overcome you with blissful serenity you long for. So will the charms of Mackinac Island, where motor vehicles are prohibited and sweet simplicity — and fudge — await. Though no secret, it continues to enchant as it has for hundreds of years.